When not working, where can we find you? – When I'm not binge watching, I'm either painting/drawing something silly, adding to my extensive traditional tattoo collection, or jumping around in the front row of a punk or hip-hop concert somewhere. Where do you like to go/what do you like to do after smoke? – After I smoke, I usually stay in and binge watch. That, and I don't like being super high in public. I'm such a fan of Indicas, it makes me somewhat of a homebody (at least until the weekend). I'm a fan of tv dramas, alien shows/documentaries, and scary movies, and they all go perfectly with Caliva's Blackjack in my PAX 2 Vaporizer. Favorite edible – This one is a dead tie for me. My tried and true are the Altai Sour Cherry Pips. These guys are bite-sized sour, soft gummy cherries that are coated in a medicated milk chocolate. I love them because edibles usually get me sleepy, but the Pips are available in Sativa or Indica, and the Indica ones are available in a double dose option too! On the other hand, I'm a huge fan of a new edible we recently acquired, the Plus Sour Gummies. Maybe I just like sour things, but these guys are too good! They're only $15 per pack, and you get twenty 10 mg pieces of assorted flavors. Each piece is coated a sour sugar, similar to a Sour Patch Kid. The herbal taste is non-existent and the gummy formula starts working much faster than its chocolate competitor. Where do you like to go/what do you like to do after you eat this? –Eating edibles before seeing a movie is the best. It's either that or my bed, really. They don't make me the most social person, and that's why I usually save them for home. Once summer comes around though, I'll be taking those gummies along for all of my beach trips. Where do you like to go/what do you like to do after you use these? The Legion cartridge really spices up my morning while I'm doing my hair and makeup. I also take it to just about every concert I go to as well. What’s your favorite thing about working at Caliva? – Well, Caliva tries to be present at a lot of community events, whether that be farmers markets or festivals or expos around town. I really like to tag along because I like to try to change people's perspectives of cannabis users. It's so silly that this is 2017 and people still think that if you smoke a joint you'll be stuck to your couch all day or your IQ will go down a few points. There are so many avenues that we present our customers with every day that the average person on the street has no idea about. It's nice to see the views of some slowly changing, especially those that are just finding out about CBD options. Heck, even my mother has put down the occasional gin and tonics and smokes her own stuff now. 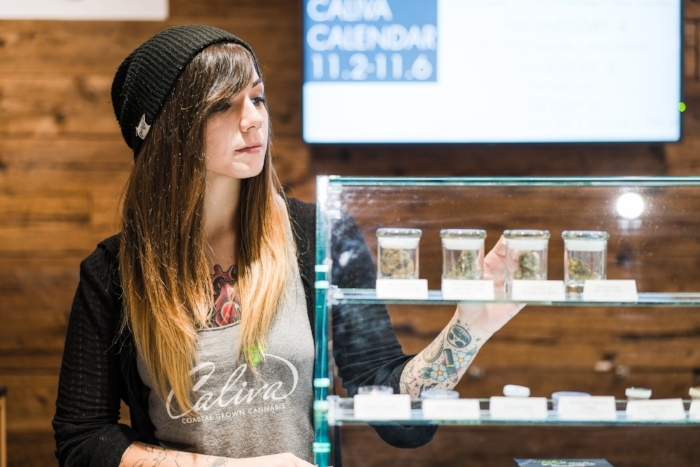 How is working in the cannabis world different from any other job you’ve had? – It's so much different being in a profession that you're actually passionate about. I came from retail management and merchandising, which was fast-paced and creative, yet unfulfilling. As I've gotten older I've had more trouble turning my thoughts off and getting to sleep at night. I used cannabis nightly to combat this. Of course, when I saw Caliva was going to open in 2015 and offer products that had been helping me for years, I had to jump on board. I feel so much more like I'm making a difference, even if that difference may seem small to some. Whenever someone comes in and tells me they haven't had a seizure in 3 months after using a product I recommended, that's the feeling that keeps me clocking in every day. What are some of your favorite spots in San Jose? – For just hanging out, I'm really a fan of AFKGG Gamer Lounge. Who doesn't love a bar with video games and great food? For concerts, The Ritz on South 1st Street is the best! As far as the great outdoors, there's nothing better than a skateboard cruise around Vasona Lake in my neighborhood of Los Gatos. Where are you originally from? – Corona, CA is where I was originally born. I've bounced around this country a lot, leaving California in the past for New York and Montana. Stoked to have finally wound up in the Bay.